The life of a landscape and wildlife photographer can be less than glamorous; inclement weather, sleeping away from home in a tent, long hours of hiking after a restless night's sleep, and eating whatever garbage you can find at a fast food place or convenience store "deli." The trip was scheduled to be a 4-5 night camp out in Death Valley National Park. Aperture Academy instructors Stephen Oachs, Brian Rueb and Scott Davis (AKA Buttermilk) were headed away to scout locations and try their best to capture some of the magic of the park in photography form. 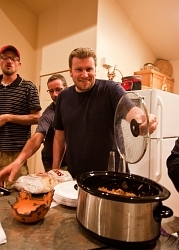 During a pre-planning session between Mr. Oachs and Mr. Rueb about food arrangements for the trip, Oachs mentioned that they should do a crockpot meal one night...which caused much laughter and disbelief in Rueb. "Crockpot would be great..." Brian quipped. "But how do we cook it?" Stephen confidently replied, "Easy...we can cook it in the car while we roll. I have an inverter...we can cook it on low the whole 10 hour drive and by the time we get there, it'll be MANNA...."
"Where do we cook it?" Rueb further questioned. "In the CAR dude! Buttermilk can hold it...."
Even though Rueb didn't think it would work, the thought of a meal cooking WHILE you travelled was too novel to discount. So, he accepted the idea and waited for the departure date. 5am: Brian Rueb rolled through a suburban Sacramento neighborhood to meet Stephen Oachs and Buttermilk Davis. One of them was holding a crockpot. Three full sets of professional camera gear and tripods. Three sleeping arrangements (bags, pads, cots, pillows). Three bags of clothing and other sundries. One ice chest with food and beverages. 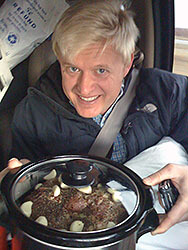 The Jeep was packed, and even though Oachs might have been joking when he said that Buttermilk would hold the crockpot, it was clearly apparent that NOW there were no other options...the only bit of available space for the pot was on Scott's lap. "It's your dinner, dude. It's either that or we don't eat," Stephen said, trying to sway him. "Just think how good it'll smell!" 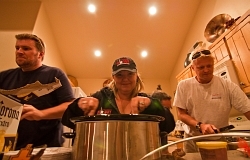 With everyone packed in the vehicle, it was time for them to head out on their journey, and begin the slow, savory cooking of the pork roast, which sat covered in Kahlua, garlic and onions in a crockpot held between Scott's legs. Nothing. No light. No cooking. No dinner! A scientific discussion took place and it was determined that a larger, more powerful inverter was needed. The determined group headed down the road, and somewhere on I-5, our happy photographers made a pit stop at a local truck stop...because if anyone knows the fine art of road cooking, it's American truckers. With a little inquiry and searching, the boys found a bigger, and badder, inverter...and made the purchase. Back in the vehicle, they got the green light from the crockpot. Buttermilk confirmed that he did in fact feel heat between his legs...and dinner was starting to cook. T minus 9 hours until Death Valley. Twenty minutes into the drive our group began to catch whiffs of the delightful meal simmering to slow perfection in the back of the Cherokee. Buttermilk started to twitch and moan as the heat from the crockpot sizzled against his inner-leg regions. Dinner would be tasty...even if Buttermilk had to walk bowlegged to get to it. Twenty-five minutes in, and disaster struck. The light on the inverter went cold. Power had been lost. Stephen quickly pulled out the device...and dropped it. It was HOT! This meal was sucking every bit of power the Jeep, and the bigger truck stop inverter, could handle. If the inverter wasn't able to function, the meal was unable to cook...and being as they'd ALREADY smelled it, this was simply not an option. Oachs thought quickly, and thrust the inverter into the cool outside air. "Let's see if it works if I cool it down outside...."
After 10 minutes of letting the inverter cool while being held out the window, exposed to the outside air as the Jeep flew down the freeway, they tested the crockpot again...and thankfully it came back on. Unfortunately, with similar results...every twenty minutes, almost with clock-work precision, the power would cut out and the inverter would need cooling. Oachs would stick the inflamed inverter out the window until its temperature reduced to a manageable level...and then the process would repeat. The good aspect of this was that they were still cooking their meal. The bad part was that it only cooked about 40 minutes of every hour...and then took a break for 20 minutes while the power source cooled. 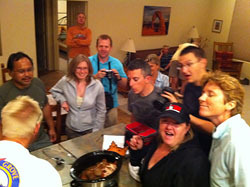 The group rolled into Death Valley National Park with a meal they assumed was about 75% cooked...and smelling delicious. While it would've been probably decent enough to eat, they felt like another 2 hours on high would seal the deal perfectly. But, where to cook it? Death Valley doesn't have a lot of places with the power needed to cook things. The group decided their best (and really only) option was the Furnace Creek gift and grocery store. Upon feeding the store clerk a tale of woe about broken inverters and potential loss of dinner, he reluctantly let the group of hapless photographers plug in their dinner, with the promise that they would return to fetch it "shortly." After a sunset shoot, and a cold beer in the Furnace Creek Saloon, our group walks into the Furnace Creek store to retrieve their dinner. IMMEDIATELY upon entering the store, they were slapped in the face with the appealing and familiar odor of pork...slowly cooked to tender perfection. The store clerk looked at them cross-eyed and ravaged by hunger from smelling the dinner for the past two hours. 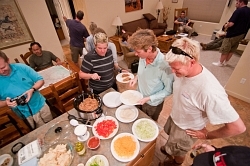 Brian grabbed the crockpot, the group thanked him for allowing them to torture him (and all the store patrons), and within minutes, the group was in their campsite devouring the meal they had spent the past 11 hours tending and anticipating. When each man had his fill of the pork there was a cauldron full of pork juices and remnants remaining. Due to the late hour, rather than clean up the dirty crockpot, the group opted to store it in the Jeep until morning, when they would have time (and light) to properly clean the cooking device. Night passed, and in the morning...what greeted them was the ghost of garlic kahlua pork past. While the smell of cooking pork was delightful the day prior, it was not the case the second day. The smell was almost nauseating...and very unpleasant. The group needed to leave in the pre-dawn hours in order to start photographing the sunrise, which meant there still wasn't sufficient light with which to clean the pot. So, they carried it with them to their morning shoot, like a smelly child. The light that morning was incredible. So much so that they never got around to cleaning the crockpot. Why stop and clean when there are photos to be made? That night Stephen came up with a genius "hands free" method of crockpot cleaning. Death Valley is home to hundreds, if not thousands, of coyotes that prowl the barren landscape in search of a meal...any meal. So, Stephen walked out to a remote section of desert and left the dirty crockpot sitting on the ground in hopes the ravenous canines would stumble upon it...and do the cleaning for them. That night around 1am they heard the first coyote find the treasure. Moments later, the others descended on the scene. It was a cacophony of coyote excitement that lasted a brief but exciting 45 seconds, then stopped as suddenly as it began...returning the desert to its eerie quiet. Still laughing, they wandered out to the area where the crockpot had been left...and found it as hoped. If you're part of one of these workshops, you're carrying on a tradition...so eat up! Cook about 9 hours or until the roast is tender and falling apart. 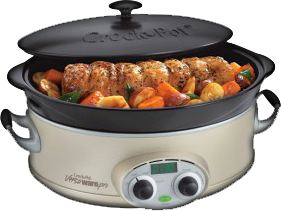 Cook above ingredients in a crockpot until the roast is sublimely cooked and falling apart into shreds. Serve with warm tortillas, shredded or grated cabbage, Monterey Jack cheese, a lime wedge and cilantro...and don't forget the mango salsa!